How Much Exercise Would It Take to Power Your Dishwasher? The dishwasher is one of the most time-saving appliances in any modern kitchen. 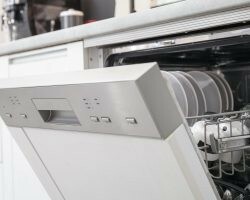 Most dishwashers can make two sink loads of dishes sparkle in an hour or less, all at … READ MORE How Much Exercise Would It Take to Power Your Dishwasher? The post How Much Exercise Would It Take to Power Your Dishwasher? appeared first on Direct Energy.